This week seems to be turning out to be the week of campus-minister-as-information-worker, but if you’re anything like me, you’re finding yourself spending more and more time on the computer as students’ lives and our organizations utilize technology more and more. Here’s another tip to help you manage life as an information worker. Repetitive Stress Injuries are simply injuries where a body part is stressed in the same way repeatedly. It’s a concern for people who spend a lot of time on the computer, because despite the torrent of data and media we consume and create on a daily basis, our bodies are in exactly the same posture the entire time. Add to that bad posture, the awkward angles of typing and using a mouse, and the incredibly un-ergonomic layout of most laptops, and it’s a recipe for disaster. The secret to avoid repetitive stress injuries is twofold: First, set your body up for the least stressful posture, and second, break the repetition with regular breaks and stretches. 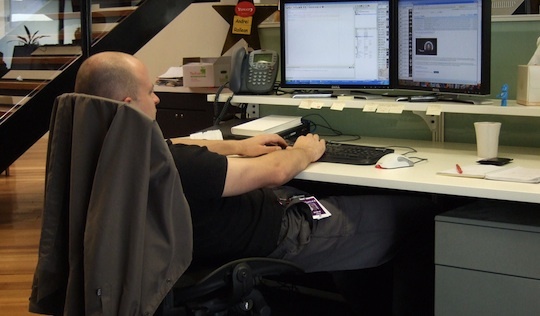 For the first part, you’ll want to learn how to set up your workstation in the most ergonomic manner. Thankfully, Lifehacker has written on this topic frequently: Plan an economic workstation, Top 10 ergonomic upgrades for your workspace, and How to Ergonomically Organize Your Workspace. For the second part, there’s an app (or two) for that. If you’re on a Mac, try AntiRSI, and Windows/Linux folks, try Workrave. These apps will give you regular reminders to take a break, stretch, and step away from the computer monitor for a minute. Category: Miscellaneous | Tags: RSI | Permalink | Post a comment | Trackback URL. Original material is licensed under a Creative Commons License -- non-commercial, share-alike with attribution.